Clouds are gathering around Hexiwear, but in a good way. 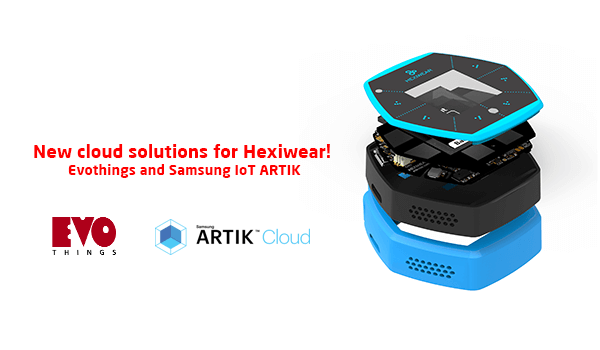 Make Java script apps for Hexiwear using Evothings – a mobile application platform for the Internet of Things. A recently published blog post on Hackster.io explains how. In brief, you will have to download the free Evothings Studio along with the Evothing Viewer app for smartphones (available both for Android and iPhone). What’s interesting is that the Evothings smartphone App syncs in real time with the PC app. The features is demonstrated in a demo that reads Hexiwear’s accelerometer. The smartphone will display the sensor readings, while the PC application can concurrently show the code running the mobile app executing in real time. More and more options for providing cloud connectivity to Hexiwear are appearing. Samsung IoT ARTIK Cloud is another one. It’s also covered by a tutorial on hackster.io. Don’t forget, the project submission deadline for the Hexiwear competition on Hackster.io is in 33 days. Enough time to pick your favorite cloud or your favorite development toolchain.